The dumbbell set includes two handles, four 0.5kg plates, four 1.25kg plates, four 2.5kg plates, 4 collars, and a extended bar. Ergonomic designed knurled handle grip makes your hands more comfortable. 143mm wide hand grip part give more room for your hand to grip, making it easier to lift without bumping your wrists for doing certain exercises. Outfit your home gym with the versatile PROIRON 20KG adjustable dumbbell set to sculpt and strengthen your muscles. It is an excellent cast iron dumbbell set for anybody looking to start in the world of weight lifting. PROIRON creatively adds in a connection steel tube for you to change the dumbbell to barbell conveniently in a second. It gives more choices for beginners to build up different parts of the muscle. 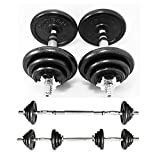 Buy PROIRON dumbbell set, you get both dumbbell and barbell- no extra cost to buy a barbell. Build the body you want with our adjustable dumbbells now! Different weight plates allow you to create several weight combinations with the dumbbells. All-in-one adjustable dumbbells get you achieve the best results and help you perform various exercises with the implement of varying weights. 1. When use the connection steel tube, please make sure to screw tightly for safety. 2. In longish weight training, please wear gloves to protect your hands. If you buy the dumbbell that are delivered by Regent Works, please note that by this shipping method we provide a free shipping to UK excluding postcode JE,GY,AB.